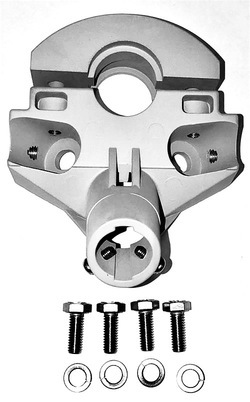 Assemble feed legs to reflector as instructed in the assembly and Instruction manual provided with the system. Insert bottom feed leg into bottom center socket on junction block until fully seated and rotate 90° until lance on leg is engaged. Insert one side leg into socket in junction block and secure with M6 x 16 mm screw and M6 lock washer. Do not tighten. Insert Opposite side leg into socket on junction block and secure with M6 x 16 mm screw and M6 lock washer. Do not tighten. Alternatively tighten M4 phillips head screw equally. Tighten M6 hardware, securing side feed legs to reflector and junction block to 5.4 N-m (4 ft-lb) and self-tapping screw securing bottom feed leg in hole in reflector socket, making sure screw engages hold in bottom feed leg. Assemble feed legs to reflector as instructed in the assembly and instruction manual provided with system. Insert bottom feed leg into bottom center socket on junction block until fully seated and rotate 90° until lance on leg is engaged. Assemble on side leg to junction block using M6 x 16 mm screw and lock washer. Do not tighten. Assemble opposite side leg to junction block using M6 x 16 mm screw and lock washer. Do not tighten. Alternately tighten M4 phillips head screw equally. Tighten M6 hardware, securing feed legs to reflector and junction block to 5.4 N-m (4th-lb).